This is the discussion related to the wiki page	Artificial Dragons Gate. Thank you to Aiden Eldritch, Shaggydredlocks, and Lady Katie for reviewing this article in the chat! The picture of Sharkie was taken by me, as Sharkie is one of my koi, so I have the photographer's permission to use this picture inherently. I don't know why this is not at the Wanderer's Library, but I don't care. This is too cute to not upvote it. I, uh, just submitted my WL application. That would be why. It fits in fine here! This is what the Serpent's Hand GOI format was created for, after all. In fact, a fun thing to do in cases like these would be to write up a Library entry (that isn't necessarily from Hand members' perspectives) about the same subject, and crosslink them together. There's now a story about said tench/carp hybrid at WL, because I finally got around to posting it whoops. This… is surprisingly awesome. Also, have you seen some of those carp in fishponds? Horrifically ferocious. I've seen swarms fight so hard for one small piece of food that some unfortunates can't get back in the water, and just desperately splash around on top of their fighting neighbors. The biggest problem would probably be letting them know that there is food on top of their waterfall. Oh, even in a properly-stocked pond, they'll still knock each other around. Sharkie's barreled her fry out of the way before. It's less that they're fighting each other and more that they're all very focused on one thing, the food. Carp are the hungriest things I've probably ever encountered, to be honest. But they're dumb wet puppies and I love them dearly. That being said, despite the ones in my pond all knowing that the top of the waterfall contains food, only Peekablue jumps it on any regular basis. There's enough food in plants and other stuff to keep the other ones happy without ever wanting to jump the falls as long as they get regular meals. Peekablue has also been known to jump over the other koi to get at food, though, so I think that's just his thing. HELLO KOI! HELLO KOI! HELLO KOI! Now I wish I could upvote comments. When you look up at the sky in about 3 hours and see a cloud of dragons flying everywhere, look to their source and you will find where Zyn lives. A cloud of dragons, and on the nose of the largest and most majestic dragon sits a small butterfly, laughing maniacally. That is the legend of Zyn. I need to sit near the horns. Sitting on the nose invites accidents when the dragon sneezes. Also dragon snot takes forever to wash out. ^ you know that info comes from personal experience. Also, I know what kind of food does Zyn baits her fish with. The fish need to be able to see it, and comprehend where it went. A lot of control is needed. So what Zyn does is she goes through her transformation sequence, turns into a butterfly, and flies over the carp pond. When the carp see her fly over the waterfall, they try to follow her. That's how she gets dragons. 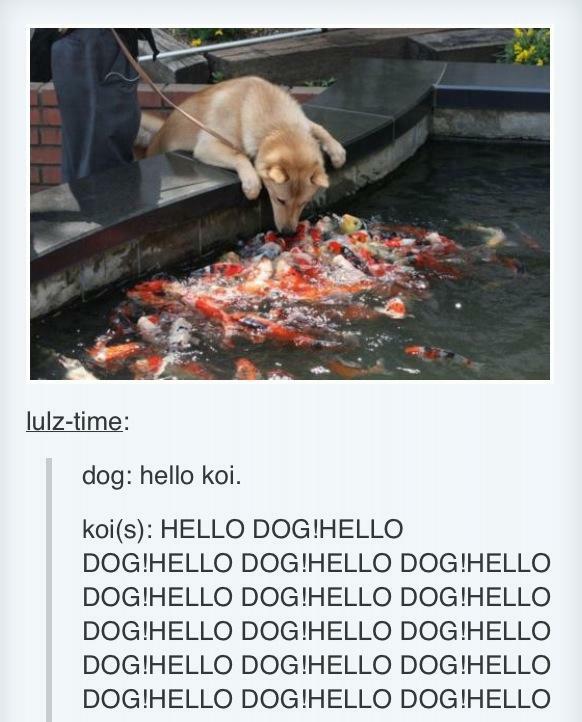 The most hilarious part of this is that it is exactly the sort of thing I've seen my koi do. Not with butterflies, but koi chasing dragonflies is always hilarious. Laser pointers are also great. Going to chase those bullies down into a dumpster? I have to say, the Hand is one of the few GoI formats I truly enjoy reading. The footnote comments are always a hoot. So I guess there's some ancient legend about koi being turned into dragons or something? Is that what I'm meant to get out of the lore section? The basic gist of the legend is that there's a waterfall (well, more than one, but I mostly went off the Yellow River myth, which is probably the Hukou waterfall) that claims that carp who leap the waterfall are turned into dragons. So yeah, you've pretty much got it. Dreamworks presents: "How To Jury-Rig Your Dragon" In theatres this Friday. You made me laugh so hard I thought I'd break my ribs again. The dragon's gate and not a word in Chinese, how could you… Anyway, good job. I have exactly zero knowledge of Chinese. If you're willing to vouch for a good Chinese bit I can put in the history section, I'll do it, but I can't do that myself if I can't read the language. I don't wanna put "monkey butts" when I meant to put "dragon's gate" in an article, that would end poorly. The in-character justification is that Laurie can't read Chinese either, and Speaker probably doesn't care enough to bother. I mean that mostly in jest, but yeah, the article's doing good right now, so let's keep status quo. Ah, sorry, I misunderstood. It seemed like a valid criticism of the article to me, so I assumed you were making a good point. is koiartistry dot com intended to be a dead link pointing to a domain squatter? Uh, no. I'll remove that link, then. Thank you! First off, this is a great article. Very well written, and I love all the banter in the footnotes. Little details like that really make a work come to life. Less relevantly: Is there anywhere one might see more pictures of your koi? You can look at my prides and joy right here! They are super cute! I mean, so adorable. I guess you could say they're… koiwaii? …Eh? Ehhh? …I'll let myself out.